Ask fellow campers about "Neapolitan Cove RV Resort" and nearby attractions. We stayed one night on the way to the Keys. It's a small resort but well maintained. We had a full hook up pull through with cable. It was long enough for the motor home and tow. Cable worked well. WiFi was stronger than most resorts. Plenty of grass for the dog. Lots of choices close by for food and shopping. They warned me when I made my reservation that there are no refunds on deposits if you cancel. We camped at Neapolitan Cove RV Resort in a Motorhome. Fairly small quiet RV park (80 spaces) appears to cater to their many repeat snowbird guests who were polite but didn't come over to chat. Both pull through and back in sites. Small clubhouse and pool. Typical landscaping of palm trees, some grass and short hedges between the sites. Mulch around the trees but oddly enough, no mulch around the short hedges just dirt/sand that you had to step in to access your bays (and track into your rig). We booked a 2 week stay about 2 months prior to our arrival. Positives: Everything neat and clean. Great location close to downtown Naples and Marco Island. Plenty of stores and parks nearby accessible by sidewalk for biking or walking. Lots of places to walk your dog. Negatives: overpriced for what you get. Spaces are a bit tight for this price range. VERY rigid reservation policies. We called prior to our arrival to modify our reservation (wanted to arrive a day later and shorten our stay by a couple of days) but was told that they had a business to run and I was "obligated" to stick with my original 2 weeks. Their online policy states that you can't shorten your stay after you arrive but apparently you can't shorten it prior to arrival either. We would not stay here again due to the cost and service here. We camped at Neapolitan Cove RV Resort in a Motorhome. GREAT BBQ right next door at I Burnt Mine. Nice walking/biking trail around lake at nearby Sugden Park. Lots of pickleball courts at East Naples Park. Try Tigertail beach on Marco Island, walk across the lagoon to the outer bank for awesome rolling waves! Try the Dolphin Tiki bar on Marco. The new town of Ave Maria was interesting, beautiful church there. Nice park located only a few miles from downtown Naples on Route 41. Located close to all shopping and about 14 miles from Marco Island beaches. We stayed off season and the park had only 5 rigs. In season the park is full. The sites are nicely landscaped and well maintained. Some sites are too short for big rigs. Satellite reception could be an issue in some f the larger sites. No showers but a nice small pool and clean restrooms and laundry. We've stayed at Sliver Lakes in the past and decided to give Neapolitan Cove a try. We are glad we did and we will stay here again in our Motorhome. We camped at Neapolitan Cove RV Resort in a Motorhome. This was a 1-night stopover heading from the FL panhandle to the Keys. Entry to the park was a bit confusing, but made it to the check-in area OK. Interior roads are a bit tight and spaces are narrow, but sufficiently long to keep my tow vehicle hooked up. Beautiful landscaping, but seemed a little over-priced to me. We camped at Neapolitan Cove RV Resort in a Motorhome. Only stayed 4 nights, but very friendly and helpful management. Some Hwy noise but not bad. Located near shopping, golf and easy access to downtown Naples and beaches. Wide drives and generous spaces in park. We camped at Neapolitan Cove RV Resort in a Fifth Wheel. The good: Extremely well manicured, friendly hosts, nice pool, convenient. The 'okay': Sites were fairly tight with the slides out and with the plants between sites. Was a challenge to get in the backside storage bays and wet area. The bad: WiFi was intermittent, cable TV was having fuzzy picture issues (but they did order a new amplifier so it may fix it), water pressure was pretty low around 40 psi, electrical experienced brown-out on at least one occasion. We really enjoyed our time at Neapolitan and would love to return, but probably will not due to the cost. In comparison to other parks in the area, this is a pretty good value, but Naples is...Naple$. The host was very accommodating from the time we got here (and he guided us into our spot) and with any other requests we had during our stay. The winter months are going to be increasingly hard to book at this park since most of those we met are planning to come back next year and stay for the entire winter months. The park is small enough that you have a great opportunity to meet other people and establish lasting friendships. The hosts are very good to plan events as well. As others have mentioned, the pool is rather small, but so is the park, so the size wasn't an issue for us. It's a great place to get some sun and cool off on the non-beach days. This is about 15 minutes from Lowdermilk beach which we preferred over the Naples Pier. If our budget allows, we will return to this park. The rate reflects the monthly rate. We camped at Neapolitan Cove RV Resort in a Motorhome. Alvino's for pizza and the Mexican restaurant across the street is quite good. For a unique beach experience, go to Tigertail and wade through the lagoon to reach the beach. If you're going to spend more than 20 hours at the beach, get the annual pass for $50 which is good at most beaches in the area. Probably a typical RV park for the Naples area. Very clean, nicely landscaped, sites long but close together. We were in the area to visit family so this was the best choice for us. Very close to everything the Naples, San Marcos area has to offer. We prefer to use campground showers and this is one thing this place was lacking. The campground did have excellent laundry facilities, a nice bathroom (no shower) and a beautiful small pool and meeting room. The hosts were most helpful and accommodating. We camped at Neapolitan Cove RV Resort in a Travel Trailer. Meticulously clean park with an attentive and friendly staff. The park itself has relatively few activities but we were staying to tour the Naples area for which it is quite convenient. Our only real complaint is that they did not have any shower facilities which is something which I would have expected. We camped at Neapolitan Cove RV Resort in a Motorhome. Sites are fantastic, staff is great. If you are totally self contained and like close neighbors this place is wonderful. But there are really no restrooms or showers available unless you use the ones in your RV. Sites are paved and shaded but they are on top of each other. Big slide outs are almost a problem since the sites are so close. We camped at Neapolitan Cove RV Resort in a Motorhome. Sites are close together but beautiful palms and foliage act as a buffer, clubhouse is small, pool is very small, the whole park is small BUT location, location, location! You can walk or bike to handy shopping, we biked almost every day to downtown Naples. The staff is exceptionally friendly and makes you feel like family. We LOVED our stay here and hope to return next year for longer time. They have two rates: the cheapest rate puts you on an outside stone wall right next to highway 41, noise might be a factor for some. The staff works hard to provide activities for their guests and they work very hard on keeping the park beautifully maintained. The park gets completely full in January and February so book early! We camped at Neapolitan Cove RV Resort in a Motorhome. This is our 2nd winter here. It's very expensive. Sites are narrow and close together, but landscaping between sites helps. Some sites flood when it rains hard. Has a small pool, small laundry, restrooms, but no showers, a nice club house, lots of activities. That being said it's rather clicky. Lots of Canadians. 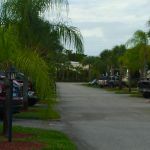 It is the closest RV park to Naples. Liked it, but we won't stay again because of the cost. Have to pay in full before you arrive. We camped at Neapolitan Cove RV Resort in a Fifth Wheel. Small,clean. Small pool. Requires payment in full prior to leaving for next season. No showers. WiFi very temperamental. We camped at Neapolitan Cove RV Resort in a Fifth Wheel. This is a very friendly, beautifully landscaped campground with easy access into and from within the park. Sites are large and paved. They have just completed the pool, which appears quite nice but is not yet open. The park is located on a main road, so there is quite a bit of road noise, especially on the row closest to the street. The wifi was flaky, cutting out a few times each day. The technical support person tried to help but could not fix the problem. We camped at Neapolitan Cove RV Resort in a Motorhome. There is easy access off U.S. Highway 41. Sites and interior roads are paved. The landscaping was beautiful. The park is under new ownership and management. Both the owners and managers were wonderful. The park has been completely renovated. A new clubhouse is being constructed. We camped at Neapolitan Cove RV Resort in a Motorhome. GREAT BBQ right next door at I Burnt Mine. Nice walking/biking trail around lake at nearby Sugden Park. Lots of pickleball courts at East Naples Park. Try Tigertail beach on Marco Island, walk across the lagoon to the outer bank for awesome rolling waves! Try the Dolphin Tiki bar on Marco. The new town of Ave Maria was interesting, beautiful church there. Rookery Island kayaking tour is a great adventure. Naples Florida is an ideal vacation destination. If husband likes to look at classic or exotic cars, wife likes to shop, and you both like to eat great food, Naples, FL is one of the very best cities in the USA for winter months away from home. Neapolitan Cove is comparatively close to it all. Downtown Naples, Naples Zoo is really a must. Tin City, driving distance to Bonita Springs, Marco Island, Sanibel Island, and Fort Myers beach. All within a 1 hour drive. Are you affiliated with Neapolitan Cove RV Resort ?